Commonly used physical and technical units symbols. In the international System (SI) the physical and technical units are validated as follows. Pressure. Old measuring units: Kilo-pond per Cm2: Kp/Cm2 Meter of water column: mH2O Millimetre of mercury column: mm-Hg Metric Atmosphere: at Atmosphere: ATM They were replaced in the SI from Pascal. One pascal corresponds to the pressure of 1 Newton, which is acting on the area of 1 m2. Unit Pa is a very low value and for standard industrial applications, the Bar (symbol bar) is used. 1 bar = 0.1 Mega-pascal (symbol Mpa = 1.000.000 Pa). The conversion from the old unit of measure to the new one (SI0 is the following: 1 Kp/Cm2 = 0.981 bar 1 bar = 1.02 Kp/Cm2 The conversion in the SI unit is also possible where the metric system is not yet used. 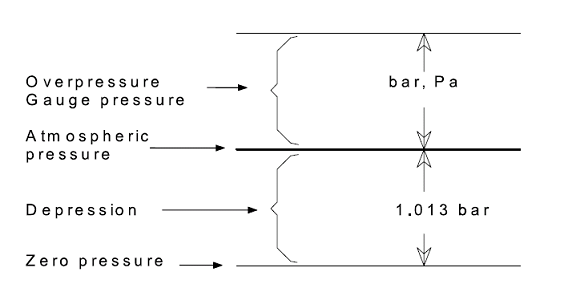 Conversion: 1 bar = 14.50 psi 1 psi = 0.07 bar = 7.000 Pa Pressure values, except specific references, are referred to the atmospheric pressure.